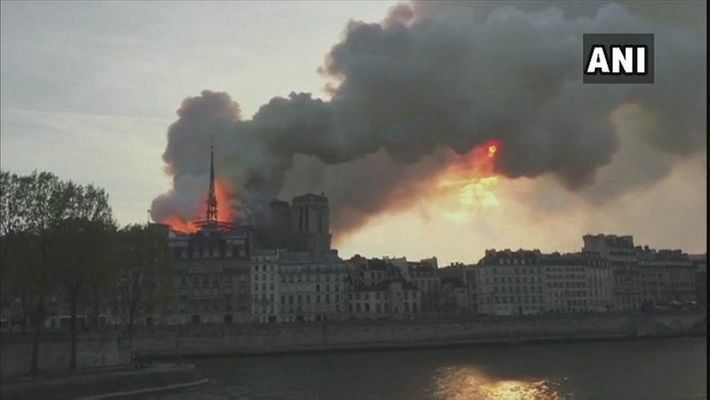 On April 15, tourists and locals watched on in horror as the cathedral, which is considered to be one of the finest examples of French Gothic architecture, go up in flames. Before the firefighters could contain the blaze, the iconic spire and roof were completely destroyed. Paris: Following the unfortunate Notre-Dame Cathedral blaze in Paris, which destroyed a century-old heritage, French President Emmanuel Macron pledged that the nation will rebuild it. French billionaire Francois-Henri Pinault, who is the CEO of the Kering group, has offered 100 million euros ($113 million) for the rebuilding of Notre-Dame Cathedral. In a statement sent to AFP, Pinault said that the money will be paid by his family's investment firm Artemis. On April 15, tourists and locals watched on in horror as the cathedral, which is considered to be one of the finest examples of French Gothic architecture, go up in flames. Before the firefighters could contain the blaze, the iconic spire and roof were completely destroyed. It is still unclear what caused the fire. According to reports, the emergency call that was made to the authorities mentioned of a fire in the attic of the cathedral. Gasps and cries erupted at 7:50 pm (1750 GMT) when the top portion of the church's spire came crashing down into the inferno that had spread to the entire roof. Hundreds of firefighters were immediately deployed to the scene and they tried to douse the flame throughout the afternoon. Paris Fire Brigade Commander General Jean-Claude Gallet said that one firefighter was grievously injured. Paris is disfigured. The city will never be like it was before," said Philippe, a communications worker in his mid-30s, who had biked over after being alerted of the fire by a friend. "It's a tragedy," he added. "If you pray, now is the time to pray." Police were attempting to clear pedestrians away from the two islands in the river Seine, including the Ile de la Cite which houses the soaring Gothic church, one of Europe's best known landmarks. President Macron tweeted: "Notre-Dame consumed by flames. Emotion of a whole nation. Like all my compatriots I am sad to see a part of us burn this evening" and expressing solidarity with "all Catholics and all French people." The spire, like the rest of the gothic edifice, had been undergoing the 11-million-euro (USD 12.4-million) overhaul financed by the French state to repair the damage inflicted by time, pollution and the weather. Has Trump rightly busted the Santa Claus trope, or should he have done a Kennedy?